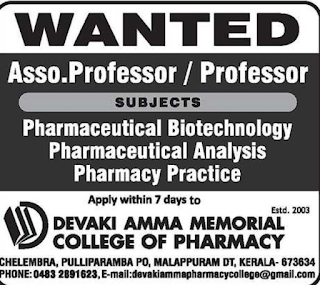 Devaki Amma Memorial College of Pharmacy, Malappuram has advertised in The Hindu newspaper for recruitment of Associate Professor /Professor vacancies. Interested and eligible job aspirants are requested to apply within 7 days from 4th April 2018. Check out further more details below. 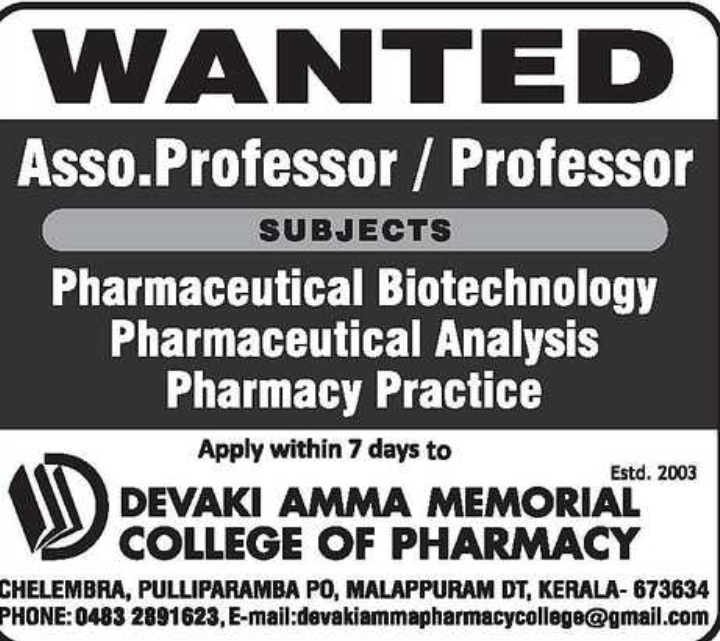 Name of the College: Devaki Amma Memorial College of Pharmacy, Malappuram,Kerala. About College:The Pharmacy College currently offers B.Pharm and M.Pharm (Pharmaceutical Chemistry & Pharmaceutical Analysis) programmes. The future expansion plans include more PG (M.Pharm) programmes in different disciplines of Pharmacy, Pharm D, Ph.D programmes and the development of a full-fledged R&D Division and Product Development Centers within the Campus.The college is affiliated to the Kerala University of Health Sciences, Approved by Pharmacy Council of India & AICTE, and Govt of Kerala. Apply by post or send email. Last Date:Apply within 7 days from 4th April 2018.